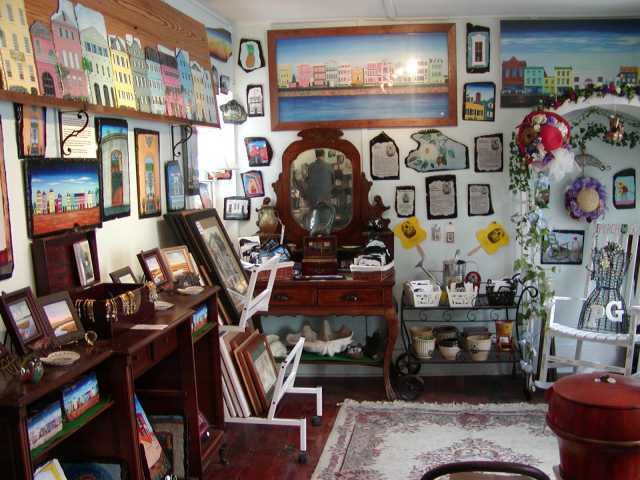 The East Bay Garden Gallery is small art gallery on Easy Bay Street just down from Rainbow Row. We first noticed this gallery when the artist and owner, W. Hampton Brand, was working on a new large painting of Rainbow Row outside his gallery. Brand is a native Charlestonian who specializes in painting the historic facades of Rainbow Row and the Battery. I really enjoy this little gallery. The owner and artist is an extremely nice gentleman. I find his work on roof tiles to be the most unique artwork I've seen in the area. I have purchased two pieces, one for myself and one for my mother. I have a feeling I will purchase another when we visit next time. 2/25/08- While walking in the area on Saturday night, we stopped and peeked through the window. I was drawn to his artwork on original Charleston area bricks this time. I picked up a nice sized brick with Rainbow Row and a smaller slate tile with Morris Island Lighthouse. I've already picked out the piece I'd like to get when we return in May. May 2008 I decided to purchase two slate tiles this time through. There was a lovely small color filled sunset over the Ravenel Bridge and one of the home along The Battery. The sunset tile is on display in my office. W. Hampton Brand's art gallery is located in a quaint little historic building located directly across the street from Rainbow Row, which provides views and inspiration for much of his best work. Brand uses slate tiles from the rainbow row houses themselves, which have either fallen off or had to be removed for repairs, as his canvas. He has also begun using original bricks, which were made at a nearby plantation (Boone Hall I believe) for some of his works. He paints the facades of the famous Rainbow Row, as well as those of the grand homes along the Battery, with his own perspective, a perspective unique to his work, and which if you ask, I am sure he would be pleased to tell you about. East Bay Garden Gallery also carries a small collection of art, generally small prints, lithographs, small oils on canvas, from other local artists.